Happy Valentine's Day and Happy Birthday to my beautiful mammy! Today I'm wearing another of Adrianna's beauties from her Valentines Day Trio. Love Me Lights Out is a milky white semi-opaque polish (2 coats was perfection) with a gorgeous glitter mix. Lavender, gold and mint micro glitters. Lavender circles and pink stars. Plus this isn't one of those fishing polishes, the feature glitters came out so easy. A spring themed polish (makes me think of Bambi and the word twitterpated) if ever I saw one. I was also itching to try these fab vinyls out by Nail Vinyls (Instagram user @teismom) so I added them to the accent and painted one coat of Essence - Black is Back. China Glaze - Seahorsin' Around & Shell We Dance? Dollish Polish - Totes Magotes! 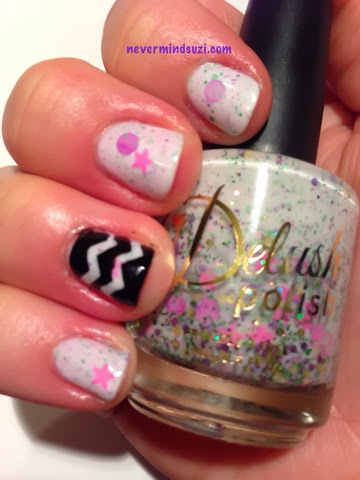 Glam Polish - Bee-Do! Bee-Do! Bee-Do!